John Dramani Mahama regards John Dumelo as his son so, on the day of his marriage, it’s only prudent that he shows up at his traditional marriage to support him just like he supported him during his election campaign period. The former president was present in his white outfit and as expected the popular ‘Onaapo’ song came up and you can imagine the atmosphere there. 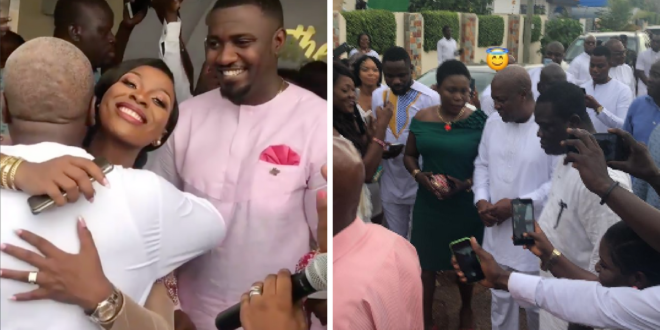 He then whispers something into the ears of John Dumelo after hugging John’s new wife, Mawunya. We even gather he’s a good friend of Mawunya because of his relationship with her sister, Selassie Ibrahim.